So great! Would love to give instructions for this to my mom in time for Christmas! hi. i would love your directions! 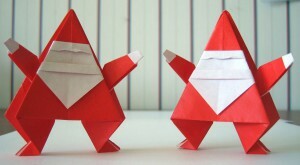 i am planning to do a santa origami with my math students (tomorrow!) and linda mihara’s santas are by far the cutest out there! i have already ordered the book for next year–this year, will have to make do with a less cute santa–one which has directions posted on line. so much for last minute plans!! Love the Santas and look forward to your instructions if you are able to publish them. I was on the Jewel of the Seas and did all but one of your classes. much appreciated! 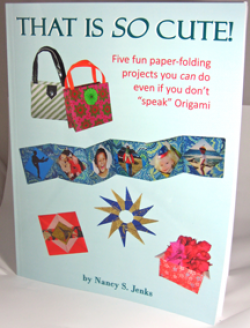 Haven’t had time for any folding since we arrived home, but like your idea of using origami for Chrstmas cards, so I’ll have to consider getting the Montroll book. A very belated thanks for your message, Leslie! I’m glad you enjoyed the classes and the Santa and hope maybe you got the Montroll book. I never got a response to my request but may still create and publish my own instructions for the Santa, it is too cute!